Microsoft’s SQL Server has a tool called Profiler that you can use to monitor every SQL query that hits the database. This is extremely useful for programmers as well as database administrators to troubleshoot the exact queries generated by an application. 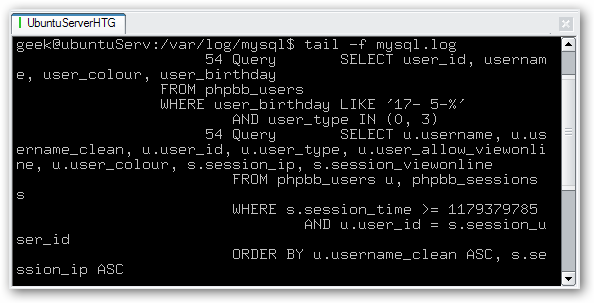 Having switched to using MySQL on a frequent basis, this was one of the first things I wanted to figure out how to do. How else can you see the actual SQL code generated by WordPress or phpBB? The first thing we’ll need to do is turn on logging of queries in MySQL. Be warned that this should only be done in development… it really slows things down to log every single query to a file. Now we’re ready to start monitoring the queries as they come in. Open up a new terminal and run this command to scroll the log file, adjusting the path if necessary. I’m impressed, phpbb3 has fairly tight, optimized SQL code. WordPress, on the other hand, is very inefficient.